ALUS Norfolk participants Steve and Anita Buehner were recently named the 2014 Sustainable Tourism Ambassador of the year by the Long Point World Biosphere Reserve Foundation. The Buehners (www.bonnieheathestate.com) have been involved with ALUS on their 180 acre farm since 2009, having implemented 13 projects totaling over 22 acres in 2009, 2010, 2011 and 2013. Seven projects involved establishing native tallgrass prairie on more than 20 acres for wind and water erosion control, pollinator habitat, improved wildlife biodiversity and to build organic matter in marginal farmed land. 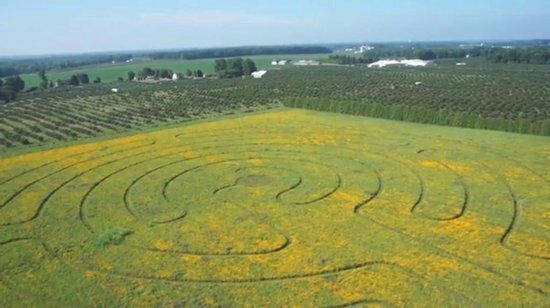 A tourist innovation created by the Buehners is the creation and annual maintenance of a labyrinth in a 12 acre section of tallgrass prairie, as shown here. Other projects included: the creation of a shallow 0.5 acre wetland in a low, wet portion of their working lands; planting of a cedar windbreak to delineate their property boundary while providing wind erosion control; and reforestation with native Carolinian trees and shrubs to buffer the wetland and enlarge an adjacent hardwood bush.